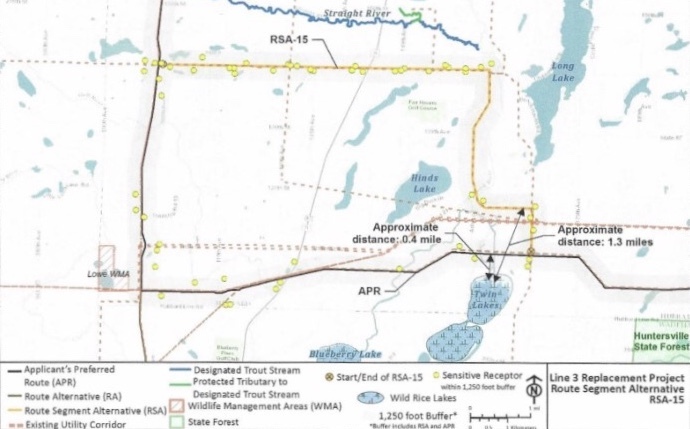 On June 28th, 2018 the Minnesota Public Utility Commission gave a verbal approval for the southern route for Enbridge (Line 3) pipeline carrying Alberta tar sands to Wisconsin. The approved route is Enbridge's preferred route (APR) and is shown in black in the map below. This segment is the option furthest away from Long Lake on this map. The Line 3 route needs 29 permits. More details will be known once the PUC issues a written statement. It is worth noting that the PUC went against the recommendation of the Minnesota Administrative Law Judge who after reviewing all the (numerous) submissions, recommended that the old Line 3, which takes a direct route to Superior, be removed and that the new Line 3 be put in its place.